Hear from Jamie and Sean Strasberger talking about their business, Because of a Case. 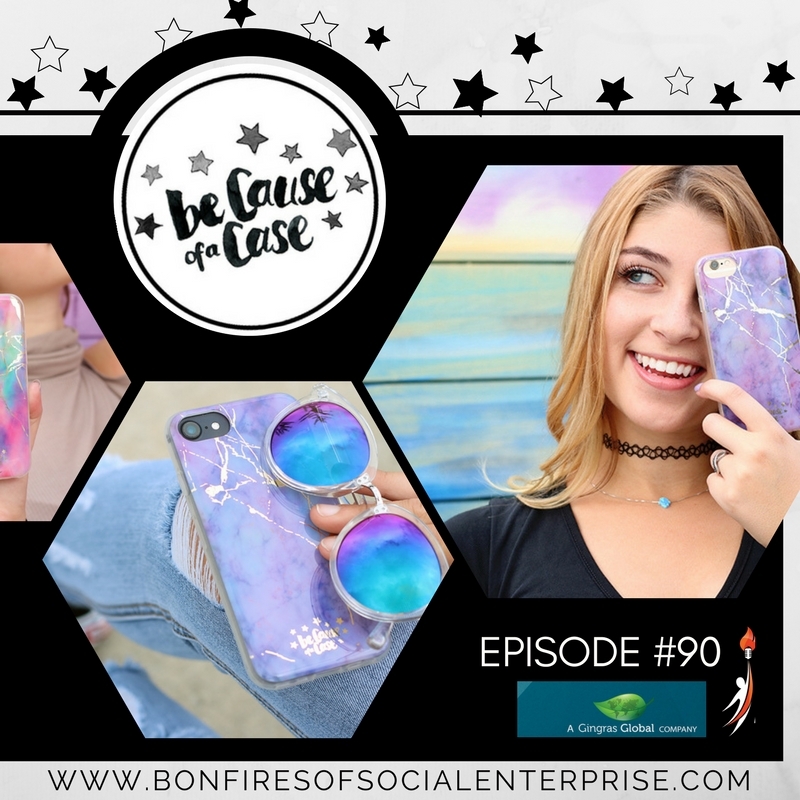 Because of a Case is a mobile phone case design company contributing to our favorite special causes. And, of course, we have a great song at the end by a Detroit artist for your listening pleasure. Hey Everyone, It’s Romy and I am back with great conversations on the Bonfires of Social Enterprise. Today we have Jamie and Sean Strasberger talking about their business, Because of a Case. And, of course, we have a great song at the end by a Detroit artist for your listening pleasure. Let’s kick it off here with a fun fuel from Natalie Hazen; she always comes up with the best fun fuels! Mobile phones have become such a part of everyone’s daily life that if you can’t find your phone, that can be a giant disrupter to your day! Been there! Phones have become so mainstream and normal, that a recent post on Facebook about an anniversary reminded me how far we have come in our technology with phones. This post was celebrating the 25th Anniversary of the first ever text message. Perhaps you remember your first text message and who it was from such as those defining moments in history where you can state your exact location and what you were doing at that moment. That was honestly no me. But now who would of thought that 25 years later it is normal to communicate via text and also send streams of happy faces, smiling little piles of poo and all sorts of characters! So happy anniversary text message and hats off to wonderful innovators such as Neil Papworth. Now on to our episode. Romy:	Let's help our listeners understand what your business is and does. Jamie S:	Okay. We're a phone case company, and for every case we sell, we donate a portion to different charities. 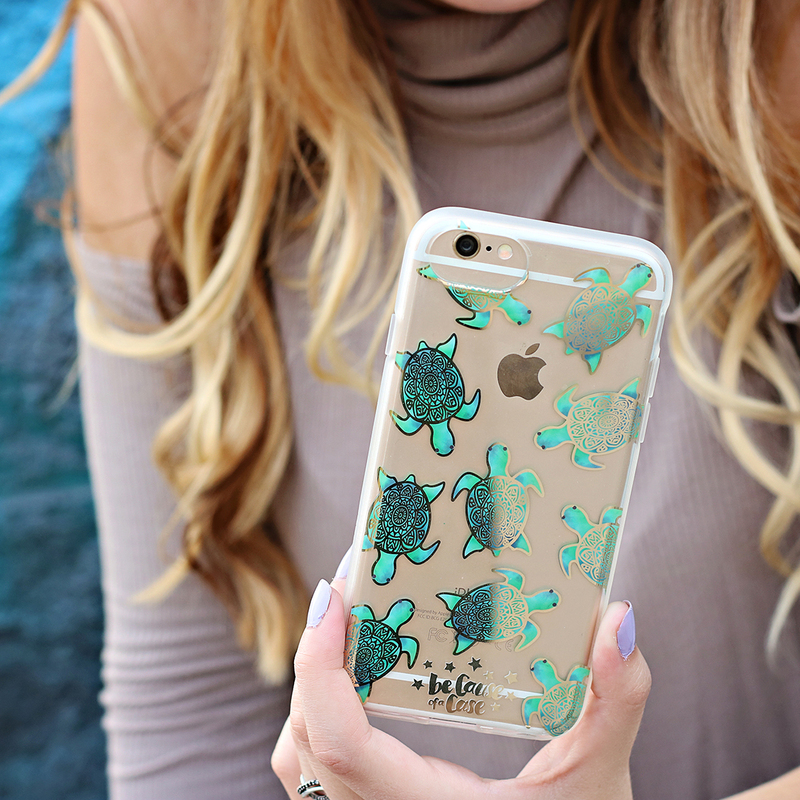 We have a phone case that we donate a portion to the Sea Turtle Conservancy, and it has sea turtles on it, metallic gold foil. We have all different designs that coordinate with different charities. Sean S:	For sure, so another organization, the Anxiety ... Association ... What? Jamie S:	Anxiety and Depression Association of America. Sean S:	Anxiety and Depression. Do that one. We have a lot of animal causes. We have a lot of human causes. We just cover a lot of different bases, and we donate anywhere from 10% of net profits all the way up to 75% for a couple of our causes. Romy:	Is the case designed for that particular cause? Am I saying that right? Jamie S:	Yeah. Some of them will have a design that we want to use, with a charity in mind. Then we contact the charity after we have the design, and show them what we're thinking. Other charities have helped us design it using their colors or their logo, and we use some of those graphics in mind when we design them for the different charities. Romy:	How do you get the charities to participate? What's been your method of solicitation? I don't feel like that's the right word, that's my geeky finance person coming out. Sean S:	It's been interesting, just because I think before we started the company, we had this idea, "Oh, we're going to help people," and that was the social aspect of it where we really wanted to bring on as many organizations, with as many causes that we were passionate about, and our followers and customer base was passionate about. We found that there's, for some of these charities, there's a lot of hoops to jump through to get them on board. You have to have a certain amount of minimum sales. There's just, depending on the charity, they're not ... Not every charity's wiling to have you on board. They need to make sure you're a legitimate company. They don't just take anybody on, which I guess I think we found kind of surprising at first, just because like, "Hey, you know, we're willing to help everybody." Jamie S:	At the beginning, we're like, "We want to donate. Can somebody let us donate to your charity." But it is about just approaching them, and especially in the beginning, we approached a lot of charities. Some of them were really open to us, and really excited about working together. Some of them, yeah, we had to have a minimum sales. So it was just about making sure we approached enough charities to get enough on our site, and enough to coordinate with our different phone cases. Sean S:	I think part of that is just because there's so many organizations out there that are similar in a sense that they're donating a portion of sales. That was one of the unique niches for us, where we found a hole, was that ... Like for T-shirt companies for instance, there's so many social enterprises that were T-shirt companies, where they donate a portion of sales. But with phone cases, when we started, and still at this point, there's not really, there wasn't a leader. So we kind of carved our niche there, and I think we're able to get more charities and organizations on board, because we're the go to charity phone case company. Jamie S:	Yeah, and we have had a couple approach us since we've gotten a bit bigger. Sometimes we'll go through emails and have some charities that now we have to look into and see if we want to work with them. So that's pretty cool too. Sean S:	At least, in the beginning, I know, it was just as hard to get charities on board as it was to find social influencers or celebrities on board, like it was ... Jamie had to work her tail off to prove our worth to them a lot of the time. Romy:	So they were almost vetting you as a vendor, even though part of the proceeds were going to go back. Jamie S:	Yeah. They just wanted to make sure that we were legitimate. We were going to donate to them. They wanted to make sure that we were going to be good to work with, and there was a lot of factors in some of them. Some of them were easier, though, to get. Romy:	It is interesting. You need people to start to buy ... You got the chicken and egg thing going there. You know. I really want to help you and help each other. Jamie S:	That's exactly it. Romy:	Let's go back and tell, maybe the story about what inspired you to get started, or what was the light bulb moment. Sean S:	That goes back to Jamie, because she got her degree in teaching, but I think it was back in 2008, 2009, where the economy wasn't doing as well. So she couldn't find a teaching job. So she had to find something else to do. That's what started it. Jamie S:	Yeah, so I was looking for different things to do. I was substitute teaching, but it wasn't really bringing in enough money. It was hard to get even subbing positions at the time, so I was really just looking for anything I could do. I had a job where I was working ... I got a job I found at, in a department store working at a cosmetics counter. I really liked doing that, and I've always liked makeup and hair. So I started a YouTube channel, and I thought I could play off on this. I built up my audience, and I have about 60,000 subscribers on my channel. Jamie S:	I was reviewing all kinds of different products and makeup and hair and food, and just anything. Sean S:	Stuff on Shark Tank. As seen on TV. All that sort of stuff. Jamie S:	Yeah. My channel name is Reviews by Jamie, if anyone wanted to check it out. But I do all kinds of reviews. Me and Sean were always talking about, we need to come out with a product that my audience would really like, because I knew my audience really well, and they're very loyal, and they're always commenting, and they're so sweet. Sean S:	I think the first thing we thought of was, we were thinking about some sort of a jam, as a play off the Jamie Jammers. Sean S:	We threw that around for a little bit. We threw all sorts of stuff around. Jamie S:	It was nothing compared to what we've spent now. It was a $3,000 machine. Sean S:	Yeah, at the time it felt like, holy moly, we were really taking a big risk here. So we bought this crazy machine. Jamie S:	But we're not the type that can use something like that and make it work. You had, there was a lot of steps involved, and we didn't make one phone case that looked good. So I was like, "This isn't going to work. We can't sell these." I'm a perfectionist too, so there would be little flaws on the printing. Jamie S:	You had to have special gloves for it, and I was like, "Sean, you can't use this. You're going to burn yourself." Sean S:	Yeah, I'm a little clumsy when it comes to that kind of ... yeah. Jamie S:	So we're like, we need ... We'll think of a different way for it. We really started talking, "Okay, we could do something more with this." I was having a lot more ideas for designs. Then we had the idea, after talking about donating a portion of every sale, and particularly to mental health, because I've struggled with anxiety, just generalized anxiety since I was a kid. So I thought this would be really cool, because we thought of a really good slogan, and it was, "Find your happy case," instead of, "Find your happy place." Romy:	Oh, I like that. Jamie S:	All these things I wish I would've had just growing up. So it's really cool, and we still work with an ADAA, but then we started having customers who were requesting different causes. So we thought, could we add more? Could we make it different? So we changed our slogan, and now it's, "Protect your phone. Protect the world." Romy:	Ah, I like that. Romy:	Registered trademark. Very nice. Well, I love that. So you abandoned the idea of doing the equipment. I guess I'd call that manufacturing it yourself. Jamie S:	We're not DIY people at all. Jamie S:	Yeah. I think I'm pretty good at finding what, and knowing what people want to see, because it's really what I want to see too. I'm really drawn to all the trendy things, and I'm pretty on top of it too, and I'll have some ideas for different designs, and then we'll see other companies do them a little bit after. We're like, "Oh, I think we were on the right track with that." Sean S:	Much bigger companies, where it's frustrating, and we're like, we just had that idea a week ago. Jamie S:	Yeah, things we didn't, we weren't able to come out with, that we see other companies do. Sean:	... Get it right up on Craigslist. Whoever's using that, I hope it's going well for them. Jamie:	I warned them too, I was very straightforward. I said, "It's very hard to use, I don't want you to burn yourself. We had a hard time making the cases", but they still wanted it. Romy:	Thank goodness there's buyers out for all kinds of stuff in the world that we live in, this time in history. Jamie:	There's always somebody who wants something you're selling. Romy:	Anyways, you decided not to be DYIers. How did you discover the steps to do it differently then? Sean:	The funny thing about that is I think we've slowly discovered, and we had a little experience because right after college we both started a videography company, where we would do weddings and bar mitzvahs. I think that gave us a lot of insight, and actually we're doing that again now. We just recently started doing it again after a little bit. Sean:	You took watercolor classes for a year in preparation for us to start this business, so we could save on design costs. Jamie:	That was fun but there were a lot of things I couldn't do, like marbles. 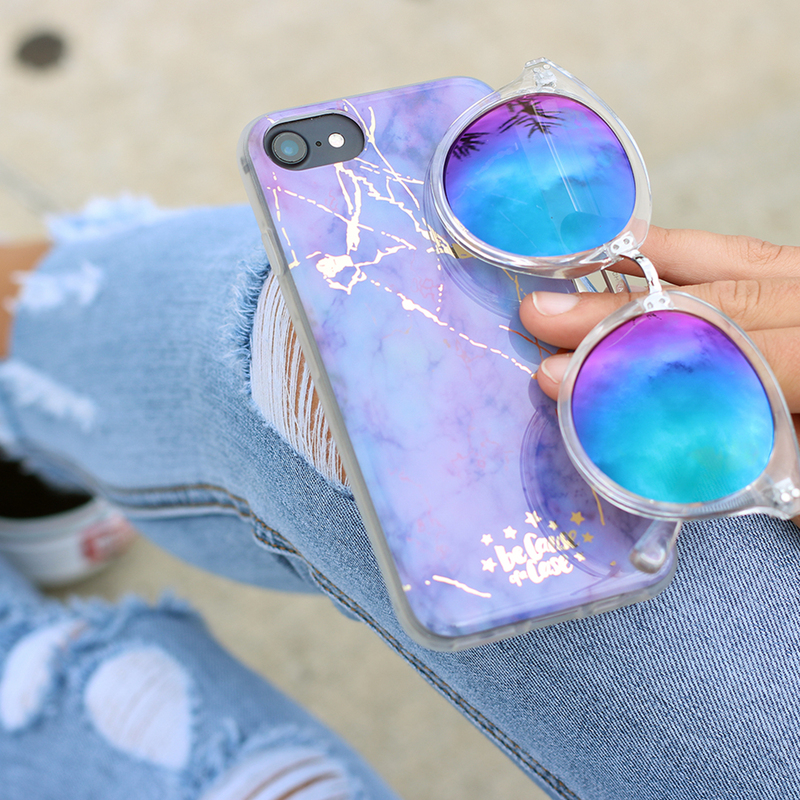 Marble cases were so big and trending. That was one big thing I really wanted to come out with. We thought, "Okay, we're going to have to get some different designers now, some people who can do things that I won't be able to do." Sean:	Definitely. I think we figured, "Okay, we can't make the cases ourselves, so let's get someone else to make them. We can't design the case itself, go get someone else to design it." We kind of figured out what our strengths were, as far as Jamie saying about how she has an eye for what's good and being able to be more of a creative director versus an actual designer. Then us not DIYing cases but finding a quality manufacturer who's able to make the kind of cases where we feel proud of, where we can sell it to our friends and family, and we'd feel pretty comfortable that they had a pretty protective case. Jamie:	Yeah, because in the beginning we had some cases that we did not like. I would have friends approach me and say, "Oh, I'm going to buy this one." I'm like, "Don't buy that one because we're working on getting a more protective line." Now we have our protective cases on the site, and we worked for six months making sure that they were protective, and they were the ones we wanted, and that they could print metallic gold foil because we wanted that on them. There was a lot of things that we had to do to get to that point with the manufacturing. Romy:	Wow. This is really interesting because I love what you guys say, because sometimes people give up when they, "I'm not good at manufacturing, not design." They don't realize they can hold this role and do it really well like you guys are doing. As a matter of fact, some of the most successful businesses do it the way you're doing. What kept you at the table saying, "Gosh, this is really our role" instead of just abandoning it? Sean:	I think it kind of goes back to when we bought that machine in the first place. It's like when you jump in, you're kind of in. It never really felt like an option to stop doing anything, I don't think either of us really ever considered, "Oh, this is too difficult." It was more like, "Just keep on grinding it out. Let's figure this out." I think part of it was the little successes along the way kind of keep you going. Where it's like, "We got something" and I think we had a vision for what we knew could be possible. As long as we could manage it financially and time-wise, we saw the vision and I think we needed to see it out. Jamie:	Me and Sean are a really good team. We're really good at brainstorming, so whenever we hit any kind of hurdle, we're like, "All right, let's talk about what we can do to get over this part." We would sit down and talk about it and research, "Okay, what are we going to do next?" Then we would do it. We were never really thinking, "Okay, we've hit a wall. That's it." It was always, "Okay, we've hit a wall. Where are we going to go from here?" That's how we've kept the business going along. Sean:	I think the key is not talking to friends and family too much about things because it'll have the exact opposite direction. If we would have been like, had we had them in all our meetings, the company probably wouldn't have ever started. We wouldn't even have anything. Jamie:	"The case machine didn't work out, that's it. Okay, I guess you're going to find something else to do." Romy:	So true, oh my gosh. That resonates with me on so many levels. What's happening now today, we're doing this interview of November of 2017. What's happening now, today? 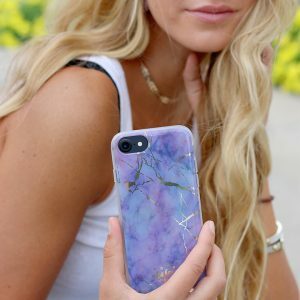 Jamie:	Right now we're really excited because we do have our protective line of cases and we have some new designs out that we're really proud of and excited about. We're just kind of waiting for the holidays right now. We know that there will hopefully be a big boost around the holiday time. We're working on other things too to get the word out. We've been working on getting into different stores and boutiques. We really want to focus on more retail, since we've really been doing online sales for a while. Sean:	Our first year was pretty much all online, then we kind of got the things in check where we can have our bar codes, have everything good so we can start selling in retail. We recently just got put into 24 independent Sprint stores. Sean:	We're centered around the Michigan area, so that was really exciting. The biggest thing we're doing now is just juggling the inventory and that whole bit of it. Yeah, retail's our next big push. Jamie:	That's our next big thing. When we started, especially me coming from YouTube, I had a really good idea about what to do on social media. We've been utilizing social media for this last year of the business and contacting different influencers. We have an affiliate program where people can earn a percentage of the sales if they spread the word to family and friends or post about it online. We've worked with some different people who have been big influencers on YouTube or from different TV shows too. We had a girl from Dance Moms work with us and somebody from The Bachelor too. Jamie:	Yeah, it's been really exciting, our whole online world for everything. Our Instagram page has over 30,000 followers now. Sean:	We started at like 0, so it's pretty ... We started, I think it was in July of last year, so July of '16, so a little over a year and we've really built it, mostly through Jamie's ingenuity. She's emailing, and emailing, and emailing, and emailing, and emailing. You've probably emailed thousands and thousands and thousands of people. Jamie:	Yeah. You just have to sit there emailing and contacting people and hope that some people will be on board to work with you or showcase all the cases and what you're doing. We've been working really hard on that side of it, so now we're moving more onto the retail side in addition to online too. Romy:	Wow, I got almost paralyzed at the number of, how you've done that in such a short time. I'd love to just have you expand on that a little bit because your tenacity to email and grow the social media following, that's another place people give up. You're trying as a business owner, especially in the early stages, you're wearing all the hats. You're quality control, you're distribution. Sean:	That is an understatement. Romy:	One of the things people self select out of in the beginning is, "I'll get to the social media at some point." Jamie:	I've totally seen people do that. Romy:	Can you talk about that a little? Jamie:	When I hear people who don't want to utilize the social media part, I'm like, "You have to do that, that's such a big part of it." That could be where most of your sales start coming from at some point, if you really work on it. I think just starting it out, at first I was talking about it on my YouTube channel a little bit. Sean:	Give it a little bump. Jamie:	Yeah, just to give it a little bump. I think that gave me an extra few hundred people. That was nice to have some people following us on that Instagram account. Then there was different things that we were doing, which one of them was sitting there for eight to ten hours a day and gathering people, just going on YouTube and finding names of people who looked like they were in the demographic of who we're appealing to. Just writing down their names, getting a chart together of their email address, their name, how many subscribers they have. Then at the end, emailing everybody. I had a little template and talked a little bit about our company. I would say, "If you wan to earn a commission on every sale you make, we'll send you a case. You can post about it, or if you just us to gift it to you." That was a huge part of it. Sean:	I think we lucked out in the sense that I'm still not able to be full time because of the case, I'm a special education teacher during the year. During the summer, that's when Jamie really got to foot to the grindstone. She'd be sitting there eight, nine, ten hours a day emailing. I think that's just one part of it, because obviously you can be doing what Jamie did and not get any hits, not anybody would be interested. I think it's having the branding, and the message, and things that appeal to those influencers. Sean S.:	... all these people with 10, 20, 30, a hundred, a million followers that, "Hey, this is cool." So, once they thought it was cool, it kind of just trickled down from there. Jamie S.:	When they started emailing back, it was exciting for us to think that they believed in the idea too. It gave us so much motivation to continue and think, "Wow, they're buying what this idea is. I think it could really work." We've got really lucky too, because there was a few people who had two million YouTube subscribers or one million subscribers who loved the idea and would show it and still continue to show the cases. So, we had some people who were really drawn to this idea and really wanted help too, because they want to help support what we're doing, with our donating to causes. Sean S.:	And we really lucked out, because ... I mean, there's some other companies who are doing this, and not too many, where you have a collab with like ... they would do collaborations with these celebrities or social influencers. So, when you have couple hundred followers, it's like, "Okay, do I really want to be partnering with this organization? Has anyone even bought anything from them?" But we got very lucky that one of the thousands of people [inaudible 00:21:10] emailed with two million subscribers is like, "Yeah, we'll collaborate with you and make a case." At the end of the day, they really took a chance on us. We were like, "Wow." I mean, it was a really big opportunity, and it was a lot of ... it really helped us springboard because it gave us a lot of credibility with YouTubers who are pretty big, who people knew. They were like, "Oh they're using it. Okay, that's cool." And they got to do a cause that they're passionate about, which just so happen to be the same cause. Jamie S.:	Yeah, it was the Anxiety and Depression Association of America. The whole thing was very full circle for me because they were much bigger on YouTube than me, and I really looked up to them. So, it was really cool when they didn't know who I was, but it was really cool when we approached them as a company. They wanted to design a case with us and donate a portion to charity and thought, "Wow, that's amazing that that worked out like that." Sean S.:	And it is funny because Jamie was saying like, "As when [inaudible 00:22:09] YouTubers." His reviews by Jamie's, her persona ... like, one of the things YouTubers do is they try to get shoutouts, so if you have 10,000 ... somebody with a million people, "So, go check this person out." Helps you out. She would email people like that all the time. Like, "Hey, can I get a shoutout?" Nothing. Then as a company, we come up with this idea out of nothing, and they're like, "Sure. We'll design a case with you." It's like, "All right." Jamie S.:	And I don't think I ever asked for shoutouts, but it was more, "Oh do you want to kind of do a collaboration on YouTube together?" Sean S.:	Do, I guess, a video, right? 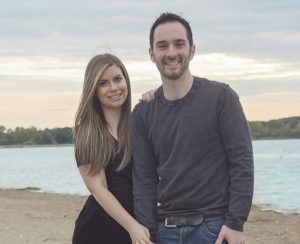 Jamie S.:	Yeah, like, "Oh we're both from the same area," or, "We're both entrusted in health and fitness or a certain makeup brand, like maybe we can do something together," but nobody was ever interested. They didn't pursue it that much, but it was really cool as a company to have the YouTubers onboard with what I'm doing now. Romy:	Oh my gosh. So, yeah, because other people look to see what the followers are, and especially in your business I would think. So, who then would we tell the lister the customer is then? Jamie S.:	I would say less. Jamie S.:	I think it's really to 25. Probably about 18 to 25 years old, but that's not to say that people younger and older don't use it because there's a lot who do. Sean S.:	Oh definitely. They're just kind [crosstalk 00:23:43] of it. Jamie S.:	When we look at our demographics on Instagram, it really is females from 18 to 24 years old. Romy:	You're doing it for them? Sean S.:	They haven't yet. Jamie S.:	I think the one charity that really had ... there was a couple charities that really participated in the designing. One of them was Charity: Water, and that's a charity or a nonprofit organization that helps deliver clean water. So, they really helped out. They had an idea of what they wanted. We kind of came to them and showed them what we were thinking. And then the other one was the charity called SheLift, and that was the charity that was founded by Sarah Herron from ... she was on The Bachelor show, if anybody watches that. I love it. Sean S.:	Jamie got me into it too. Jamie S.:	Yeah, we watch it all the time, so it's fun to work with Sarah Heron from The Bachelor and her charity, and she had very specific ideas about what she wanted to do. She sent us her logo that we could maybe incorporate a little bit. She picked out the design out of 10 that we showed her. Sean S.:	It's a real cool organization. She's actually ... I'm not sure how you'd word it exactly. I think she's missing part of a limb. Would that be the best ... So, like, has a disability, and so she empowers other women who also have disabilities. Sean S.:	It was really cool. Part of the funding that we sent actually helped send some of their women to a ... What was it? Like a retreat, like a winter retreat I think it was? Jamie S.:	Yeah, it was the first retreat they were doing. They had girls with different physical disabilities that were going on these retreats. It would help their self-esteem and just meeting friends and people who were more like how they were and had more in common, but it was really cool. We helped fund that first retreat they went on. Romy:	Well, that's nice that they circled back and given you some impact stories about what's happened. Sean S.:	Definitely [crosstalk 00:26:01], yeah. Really cool. Romy:	Are most of the recipients given you feedback? Or I assume that's hard to get sometimes too. Jamie S.:	Yeah, they do. They will email and say ... and I think they email other partners that they have, other business partners, and let them know what they've been doing this year. How much was donated to different aspects of the charity. Sean S.:	I know another one was Minding Your Mind. I know they'll do different events. We actually had the pleasure of selling our cases at one of their events that was here in the area. It was the one on social anxiety. They actually featured ... I forgot. It was a NFL player who was pretty outspoken about having social anxiety, and there was a whole event. They had like a professor that kind of talked about it and that type of thing, but our funding helped fund one of those types of events. So, that was pretty exciting too. Jamie S.:	So, some of our older designs and the cases that aren't part of our new protect series. That's what we're calling our protective line. Those ones range from $10 to $15. The case is that we're really pushing in that we really love are the protect series. Those are $28. Romy:	Okay, so gosh. There's really price to compete with everything. Jamie S.:	Yeah, we wanted a price that people could buy and it wouldn't be too much. Sean S.:	So crazy, yeah. Jamie S.:	Too expensive, but we also wanted to deliver a really nice case with a lot of protection. So, it was perfect. Romy:	Good for people like me. Jamie S.:	Yeah, and us, that's why we wanted it. Sean S.:	Us too. The funny thing about our company is since we started our company, we dropped our phones more now since we started because of the case than we ever did in our whole life. Jamie S.:	I think we're just ... I don't know why. We're just, "We have the cases," and whatever. Sean S.:	We're good to go. Yeah, boost, throw it around like a backpack. Romy:	Well, gosh, there's so many things I want to ask you, but I'll stay on track. What are you noticing about the business side of it? I mean, I'm always curious to figure out how you price things. I think that that was a solve-for-X strategy for all of the entrepreneurs including myself all the time. It's never a set thing. It's a moving target. What kind of discovery strategies did you guys go through trying to figure out how you were going to price it? Did you bench it against other ones? Sean S.:	Yeah. 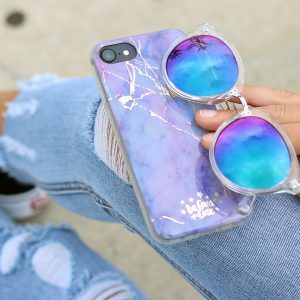 I think, we got, with what we picked our product, with like cellphone cases, iPhones cases for us, there's a nice profit margin, which gives us a little more leeway. So, I think we mostly looked at the competition and wanted to price it. So, like Jamie said, it was our protect series especially. It's a nice case. We want to make sure that price reflected it but also that people were ... cases, especially for audience of 18 and 25, especially when they're buying it online from us, they're not necessarily buying it with their phone. They're not buying it when they get it at the Apple Store, or they get it at Verizon. It's more of like, "Oh I need a new case." Jamie S.:	Or, "I want a fun case," or, "I want one that supports the cost." Sean S.:	Right, exactly. So, something that draws them in. Jamie S.:	A little under. Sean S.:	A little below the competition. Jamie S.:	I really wanted ... let's say there's girls in college who want a phone case from us. I really wanted them to be able to buy it and not think that it was out of their price range, because it's so important for them to be able to buy it and be able to help out a cause that they're passionate about. We didn't want to price it out of that range for them. I didn't want it to be, "Oh it's so expensive." Sean S.:	We went through some market research, too, that said that a high majority of customers buy iPhone cases or their smartphone case is under $30. Our competition, a lot of them went price between like $35 and $40. We're just kind of looking at what was an affordable price, but still something where they knew they were getting a quality case. Romy:	That's so great you're able to do it, because so many of the social entrepreneurs have to price way above, and then sell the reason why there's that differentiation in price. You almost fall in the trap of doing the mercy sale where you don't want to be ... nobody wants to be there. They're buying it for this story and they don't really value the quality of it. The quality is a surprise, you know? Romy:	It's like [inaudible 00:30:45]. It works too. Great. Jamie S.:	Right. 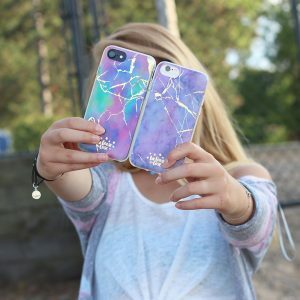 Well, that's why had our other designs and our other cases that sell for $10 to $15. Those are lower than what we started out with, because we really realized after we got those cases that, okay, they're decent. They're pretty protective. Some of them are more protective than others, but we can do much better. So, we changed the price of those, and we lower them a lot when we got our new protect series in. Sean S.:	Just to reflect the difference in protection. Jamie S.:	Yeah, we wanted people to know. And people were buying those other ones at a way higher price, but we didn't feel comfortable doing that. We wanted them to know this case is just more fashionable. It may help a little, but it's not going to your protective phone case that you would want to use all the time. Sean S.:	I think too, it's like, I think because a phone for a lot, especially our Target demographic, its like very personal to them. They already have a very clear idea of ... they'll go to certain stores in the mall, or Target, wherever there's like $5 and $10 phone cases. Some of our audience kind of has in their mind that like, "They should be very cheap," but we'll get comments in our Instagram sometimes like, "This is very expensive," even though our price is like far below the competition, because we're kind of not ... especially now, our cases aren't that low end. They're more of the high end. I feel like the case made or [inaudible 00:32:10]. There are more online with like the premium cases you could get anywhere. Romy:	So, what would be an ideal client for you? Would it be a corporation that would do a mass order? Or would it be still be ... if you said, "Gosh, if we get one of these," what would that be? Jamie S.:	That's because hard I'm torn. I think we love selling online. If we could just sell everything online, that would be really cool too, because it's fun to promote it, and we have everything down for like how to package, and we can get them out the next day. We're really quick with shipping. Sean S.:	Yeah, always the next day. Jamie S.:	So, I would say, if we could only do it online that'd be really cool, but now that we want to go more retail and stuff, I think it would be exciting to get into a lot of boutiques now, because all the designs would go really well with just that, like boutique setting, with the cool clothes, and the trendy handbags, and the cases would fit in really well. Jamie S.:	Or maybe around like college campuses since we have a lot of college-age girls who purchase, that would be really cool to get into stores around there, or to use their logos. Romy:	Yeah, their school or university's stores, and all that. Jamie S.:	That'd be really cool. Sean S.:	Mission-enriched, and we're like, "We definitely fit in here." Jamie S.:	I went down the blanket isle, because I was looking for a little blanket, like a throw blanket. They had blankets that give back. So, if you buy them, a portion goes to different charities. Jamie S.:	Yeah, and we thought, "Well, we would be perfect here. It would be really cool to get into a big department store." Romy:	All right. Well, that's neat. So, no corporate gifting at this time? Jamie S.:	I don't think so. Romy:	Not really? It doesn't seem to fit, right? Romy:	I'm just trying to learn how this all goes. All right. Sean S.:	Unless we're having a corporation with all 18 and 25-year-old [crosstalk 00:34:27]. Romy:	Right. Well, I might have a couple of them around, but I may know some. Romy:	If you let yourself dream big, with what you know today, what could be some big dreams about what you've loved to see in terms of what your company's giving to charities? It could be a dollar amount and/or what you'd like to see the business grow into. Jamie S.:	We've had a couple days where we talked about different tragedies or different natural disasters that have happened recently here in the U.S. We've wanted to give back so bad, but we're not a huge company. So, we were trying to think of ways that we could really give back. So, we had a few of our cases where we donated 100% towards different hurricane relief or different victims of different crimes. Sean S.:	What happened in Las Vegas recently. Sean S.:	The foil case. Jamie S.:	... from different cases, but it wasn't as much as I wanted to give, because we're not a huge, gigantic company. It would be really nice if we just continue to grow and get bigger. We can do more things like that and just really be able to donate a lot more and have even more causes and donate a higher percentage one day, but that would be really nice to be able to do. Romy:	You guys are a well [inaudible 00:36:07]. Sometimes we interview teams and whether they're connected the way you guys are or not. And they are either totally have the same voice or there's a lot of disruption there and it's really ... I feel good to see you guys on the same page. Jamie S.:	We have brainstorm and have meetings all day every day about everything. So, we've had a lot of discussions about every aspect of the company, so I think we're generally on the same page. Romy:	That's so great. Well, let me make sure I get everything here. Okay, I did. So, let's make sure we tell them how to reach you. Maybe start with your website first, and then maybe give them your social media? Jamie S.:	Yeah. So, our website is becauseofacase.com. Sean S.:	Our social medias are all the same, so instagram/becauseofacase, facebook.com/becauseofacase, twitter.com/becauseofacase. Jamie S.:	It's easy to find us. Romy:	That's so great. We'll make sure we have all the hyperlinks for you in the show notes on it. Romy:	Thank you so much you guys. Jamie S.:	Thank you for having us. Sean S.:	We really appreciate it. They are so humble and joyful. Business is so tough sometimes, and it was really nice to spend time with this couple. Be sure to click on our show notes for more pictures and links.